It is unlikely that all your contacts/ subscribers will like the same type of content and context. Each subscriber’s buying stage can vary, which means their need of content will also differ. Inside Aritic PinPoint, you can segment the contacts based on many filters. These contacts can be segmented along filters and the segment created through using these filters with conditions are dynamic. This means when you have setup the segment filters, then the contacts meeting the filter conditions will automatically get added inside the segment over time. To send and automate relevant marketing messages, Aritic PinPoint provides dynamic segmentation for your subscribers rather than just a manual list building. According to the change of behavior and activities, the segments will get updated for your subscribers so that next time you want to launch a campaign, you just directly pick the right segment and get going. Go to Contacts > Segments inside Aritic PinPoint. 2. Click on “New Segment”. Fill the initial entries such as Name, Alias, Description. 4. Here you can choose the field, the type of operation to perform. These vary depending on the way you wish to filter your contacts. 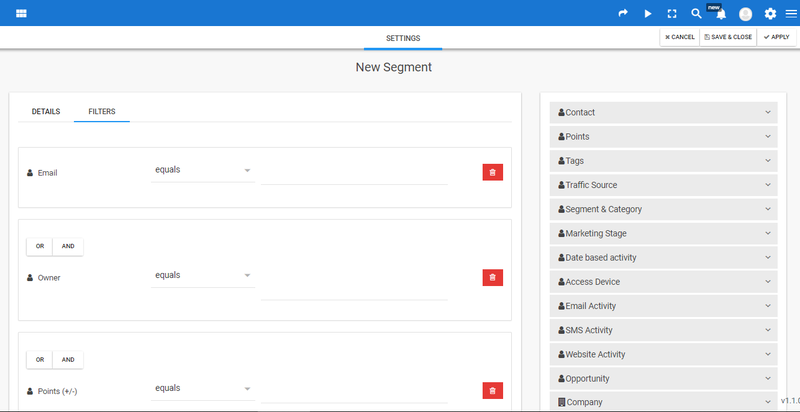 You can use the segment of contacts while sending the campaigns.